I really like essential oils, and I really like nail polish (although ironically, I don’t wear it very often). I’m also space-challenged in my current place. And have I mentioned I like making, painting, crafting stuff? I decided I could find something that would help, so I went on the hunt. I could have ordered them online, but my sister and I decided to have a day trip to our “local” IKEA, which is a few hours away. 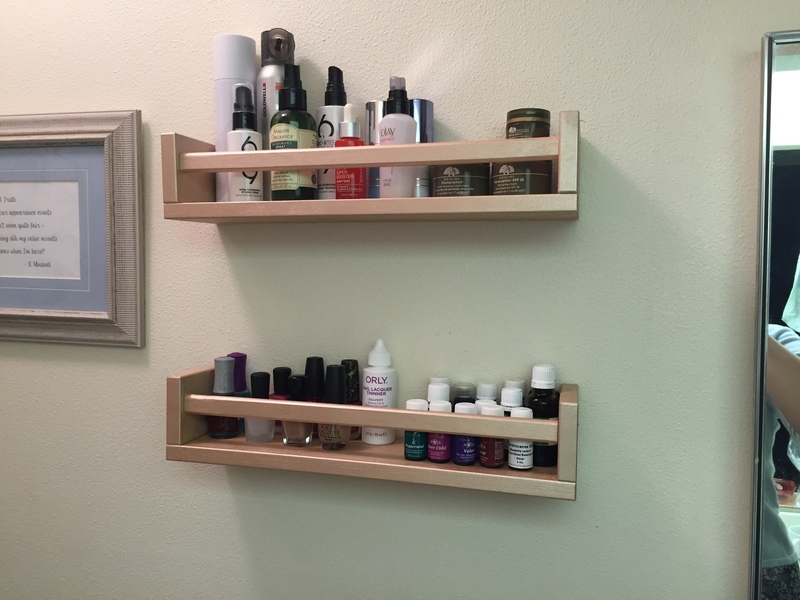 It was fun puttering around the store and I squealed when I found my shelves–for only $3.99! Last night my brother helped me hang the shelves, as I’ve never used screws and those plastic thingamabobbers that go into drywall. Now I know how! ::flexes:: As soon as they were up, I loaded up my nail polishes, oils, and face and hair products. I have so much more room in my linen closet now. And everything I use on a fairly often basis is organized and within easy reach. Love! I just love how these turned out! Fabulous. And I’m thrilled you could use that paint too. Looks great and a wonderful bargain.